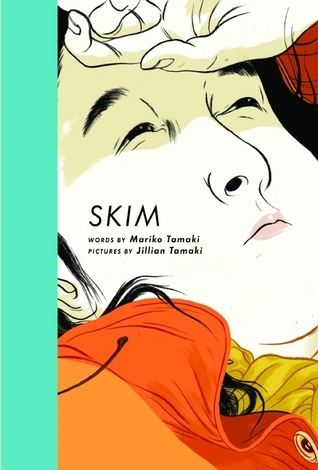 Two more graphic novels to add to my recent reading streak: I was told I must read some Mariko Tamaki. 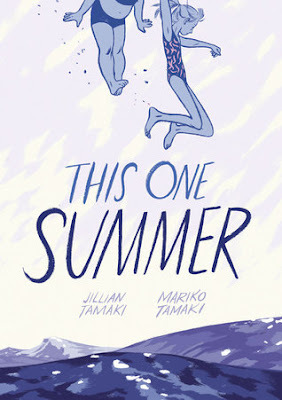 So I checked my library and behold, two titles by cousins Mariko and Jillian Tamaki. First I read this longer book. And really liked it. Rose and Windy are summer friends whose families have been vacationing at Awago Beach for years. This year, Rose, who is older, is starting to notice boys. She and Windy observe the development of a local crisis as the weeks go by, while Rose also tries to manage her parents who are arguing and distant. Both of these storylines meld, coming to a head in one incident at the shore. It's a simple book, with sketched blue & white illustrations, but with so much feeling in it. The drowsiness and pace of a summer at the lake is clearly evoked, as are all the relationships that drive the story. Rose and Windy's friendship is realistic and engaging; the story that emerges to explain Rose's mother's depression and anger makes so much sense. And the local drama between teen lovers is both everyday and intense. These young girls are realizing that everyone around them has a secret, and in their own friendship there are things they don't tell others about, nothing scandalous, just their own. I thought it was lovely, intriguing, and evocative. I really enjoyed this book. If you want to feel like you've had a trip to the lake this summer, read this book. This much briefer book is for a slightly older crowd. In it, Skim is a teen goth at a fancy private girl's school. When one of the cool girls, Katie, is dumped by her boyfriend - who then goes on to kill himself - it upends the school. A clique of cool girls starts a club, Girls Celebrate Life!, which strangely enough Katie doesn't feel like joining when she finally returns to school with unresolved anger and two broken arms. Skim, generally a bit of an outsider as a wannabe Wiccan Goth, befriends her, understanding her emotional upheaval. Skim herself is going through quite a bit of emotional stress. She's fallen in love, with someone she really shouldn't have, and any relationship will be doomed from the start. This book is darker and more steeped in the angst and heartbreak of being young and questioning everything, including your own sexuality, identity, and reason for living. It wasn't all gloom, even if the subject matter was very serious - there was a touch of lightness and a sympathy with the reader inherent in it. Although the subject was darker than the first book I read by the Tamakis, the illustrations were brighter, more intense. I did feel, though, that the ending was inconclusive and a bit unsatisfying for me. It was well done and absorbing, but in the end I think I preferred This One Summer just a bit more. Still, both are really worth exploring. Melwyk, both of these new to me books sound worth reading. Great reviews of these graphic novels!